Temple Glassier is still a self-proclaimed mess. It’s been less than six months since her son, 15-year-old Basalt High School freshman Patrick Palardy, killed himself. But she’s doing everything she can to ensure his name will live on, and that comes from not shying away from the circumstances around his death. “The thing that stands out the most to me is all the parents that would come up to me and say, ‘thank you for talking about it.’ Everyone’s first impulse is to say my son died, not to say that my son committed suicide, which was huge,” Glassier said. Anhedonia is the inability to experience pleasure from activities usually found enjoyable, e.g. exercise, hobbies, singing, playing an instrument, sexual activities or social interactions. The relationships between anhedonia and suicidal ideation or suicide attempts were explored in a large sample of physicians using the interpersonal psychological theory of suicide. We tested two hypotheses: firstly, that there is a significant relationship between anhedonia and suicidality and, secondly, that anhedonia could mediate the relationships between suicidal ideation or suicide attempts and thwarted belongingness or perceived burdensomeness. In a cross-sectional study, 557 physicians filled out several questionnaires measuring suicide risk, depression, using the abridged version of the Beck Depression Inventory (BDI-13), and demographic and job-related information. Ratings of anhedonia, perceived burdensomeness and thwarted belongingness were then extracted from the BDI-13 and the other questionnaires. Significant relationships were found between anhedonia and suicidal ideation or suicide attempts, even when significant variables or covariates were taken into account and, in particular, depressive symptoms. Don’t let mistakes define you or limit your self-worth. That was the message Roger E. Breisch gave to students Monday morning at South Lewis Central School during the first of a week full of suicide-related talks to students and community members throughout the north country. “Mistakes make you human, not inhuman,” Mr. Breisch said. And he knows of what he speaks, having spent the past 15 years and more than 3,000 hours counseling callers on the Illinois state and national suicide hotlines. Mr. Breisch told students and staff members at South Lewis, along with those at Copenhagen Central School via videoconferencing, that he started volunteering on the hotline at the age of 51 after being asked to speak to his local suicide coalition and hearing stories of board members who unexpectedly lost their children to suicide. “I didn’t want that to happen to me,” he said. When someone visits the buildings of Shawsheen Valley Technical High School in Billerica, as they walk through the secure foyer, they have to get their driver’s license or another state-issued ID scanned. But the secure foyer does kind of a high-level national background check, too, explains Superintendent Tim Broadrick. The “LobbyGuard” scanner is the size of a computer tablet. It scans a driver’s license, takes a picture of the school visitor and if all is OK with the person’s background check, almost instantly clears the person to enter the school. An employee behind a window then pushes a button and unlocks the door to the school hallway. Amid nationwide concern about school shootings, there’s talk at Shawsheen Tech of covering the wall of glass in the lobby with a special film to make it harder for a bullet to pierce. There’s also a police officer – known as a school resource officer – stationed at the school. He has an office in the lobby. And the school has adopted another security measure to try to protect students from attacks – one you can’t see. It’s a computer program designed to detect threats against the school in social media posts. And it runs 24/7. Here’s how parents can get kids who are at risk the help they need. Suicide is a serious public health concern, and data continues to show disparities between risk and prevention efforts. There has been an ongoing discussion about the mental health of youth and the need to address difficulties before they reach the level of a crisis. However, parents, teachers and other adults may overlook concerning signs when behaviors are falsely attributed to typical child development. According to the Centers for Disease Control and Prevention, suicide is the second leading cause of death among individuals ages 5 to 18. The American Foundation for Suicide Prevention reports that in 2016 the suicide rate was highest among whites, at about 15 per 100,000 individuals, and second highest among American Indian and Alaska Natives. Teens and young adults who harm themselves without suicidal intent often kill themselves soon afterward, and the increased risk of death is greatest when guns are involved, a U.S. study suggests. Researchers examined insurance-claim data on more than 32,000 patients ranging from 12 to 24 years old who were followed for one year after a nonfatal self-harm episode. Unlike suicide attempts, which require suicidal intent, episodes of self-harm can also include poisoning, cutting, firearms or other violent methods used to cause nonfatal injuries. Poisoning was by far the most common method of self-harm, accounting for 65 percent of cases, followed by cutting at 18 percent, the study found. Guns were used in slightly less than 1 percent of cases. A study led by Columbia University Irving Medical Center (CUIMC) revealed that young Americans had a sharply higher risk of suicide in the months after surviving a deliberate self-harm attempt. The authors say the findings, published online today in Pediatrics, underscore the need to direct clinical interventions toward youth who survive such attempts during this critical period. Nonfatal self-harm—meaning self-poisoning or self-injury (e.g., cutting) with or without suicidal intent—is common among young people. Although around one-third of young people who die of suicide have nonfatal self-harm events in the last three months of life, little is known about which young people with self-harm are at the highest short-term risk of suicide. Most statistics are meaningless. But once in a while one comes across a figure that cannot be summarily dismissed. According to the Centers for Disease Control and Prevention, between 2006 and 2016 there was a 70 percent increase in the number of white children aged 10 to 17 who committed suicide in this country. For black teenagers, the increase was even higher, at 77 percent. Only 48 American teenagers in 100,000 die each year; at present some 4,600 Americans between the ages of 10 and 24 take their own lives every year, which makes it the third leading cause of death. The death of even a single child is something that’s almost impossible to discuss without finding language inadequate. How can one even begin to come to terms with the fact that in the wealthiest, most powerful country in the world, a growing number of young people, of all races and classes, are taking their own lives? Why is this happening? Andrew Michael Leach, a sixth-grader at Southaven Middle School, committed suicide after being bullied, his mother told a television news station earlier in the week. Andrew was only 12 years old. It’s mind-boggling to think that a child would even consider suicide much less carry it out. Andrew’s mother, Cheryl Hudson, told WREG that her son left a note for his family and then hanged himself. Hudson said she talked to the principal about the bullying and Andrew’s father discussed the bullying with a teacher. “But from what we are hearing, there was a group of kids that would go around calling him fat, ugly and worthless,” Hudson told the station. Suicide is now the 10th leading cause of death in the United States, having risen 24 percent over the last fifteen years, particularly among teenagers, and Utah is no different. Suicide is the leading cause of death among individuals in Utah ages 10-24. According to the American Foundation for Suicide Prevention, suicide is the leading cause of death among individuals in Utah ages 10-24 and the second-highest cause of death among individuals ages 24-44. As suicide is becoming more prevalent, it is vital that individuals learn how to recognize the warning signs as well as how to react when someone becomes suicidal. Adolescent depression is increasing at an alarming rate. Researchers say as many as one in five teenagers suffers from clinical depression, and untreated, it is the strongest risk factor for suicide behavior. WHNT News 19, along with the Huntsville Hospital Foundation, is taking action to arm parents with the knowledge to spot depression warning signs in teenagers and the confidence to talk about it. The daily pressures teenagers face are enough to put them on edge. A new study published by researchers from the University of Illinois at Chicago suggests that the drug oseltamivir – commonly known as Tamiflu – does not cause an increased risk of suicide in pediatric patients. Q: With what seems to be a rise in teen suicide, both across the country and locally, what should we know as parents, friends and community members to help change this frightening trend? A: The past year, suicide has made headlines many times, for not only the losses of iconic rock stars, but also the tragic losses of our friends, neighbors and loved ones. Suicide also made headlines as the focal point of rap artist Logic’s record-breaking hit “1-800-273-8255,” featuring Khalid and Alessia Cara. What inspired a telephone number to be the title of a rap song? It happens to be the 24/7 direct phone number to the National Suicide Prevention Lifeline. The American Association of Suicidology reported suicide was the second leading cause of death for 15- to 24-year-olds in 2015, and the second leading cause of death for youth ages 10 to 14. Centerstone will host a free screening of the film Suicide: The Ripple Effect at Southern Illinois University Edwardsville (SIUE) on Monday, April 9, 2018, at 7 p.m. 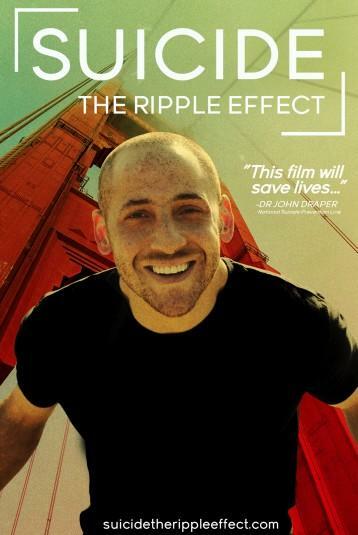 Suicide: The Ripple Effect shares the story of Kevin Hines, who at age 19, attempted to take his own life by jumping from the Golden Gate Bridge. Hines is one of only 36 individuals to survive this jump. Seventeen years later he is on a mission to use his story to help others find hope and stay alive. The film is part of a global mission to help reduce the number of suicides and suicide attempts around the world. The family of a 6th grade Southaven Middle School student confirmed he took his life Tuesday, March 6 after being bullied. Cheryl Hudson, the mother of 12-year-old Andrew Leach, tells us her son killed himself over continuous bullying. She says he left a note for his family and then hung himself. His 16-year-old brother found him. Rylan appears to be the youngest person to take his own life in Washington since at least 2013, though data for last year isn’t available, and the idea that a child so young would commit suicide is unfathomable to most. But in January this year, another African-American child, 12-year-old Stormiyah Denson-Jackson, apparently hanged herself in the dormitory of her charter school in southeast Washington. The National Suicide Prevention Lifeline received a lot of attention in 2017. Calls to the suicide prevention service tripled after rapper Logic performed his song named after the Lifeline, “1-800-273-8255,” at the Grammys. Now, Congress is considering a piece of legislation that will take a closer look at the life-saving resource. On Saturday, Senator Orrin Hatch of Utah (R) took to the Senate floor to explain why this bipartisan proposal — called the National Suicide Hotline Improvement Act — would make it easier for Americans to get help when they’re experiencing suicidal thoughts. “Across our great nation, there are millions of people, especially young people, who are alone and suffering in the shadows of depression. Many of them are bombarded by suicidal thoughts and have no idea where to turn for help,” he said. Hatch explained that the Lifeline number itself — 1-800-273-TALK — is not intuitive or easy to remember, especially for those experiencing a mental health emergency. He also shared an anecdote from a mother whose daughter tried to call her therapist but couldn’t get through the day she died by suicide. This new bill would create a three-digit suicide and mental health hotline — so one day, reaching a crisis counselor could be as easy as dialing 911. Two months after her son committed suicide, Teresa Tronerud was handed a review detailing how his school, Marianapolis Preparatory School in Thompson, had handled reports he was being bullied. She leafed through the 28-page document, written by a Hartford attorney hired by the school as a third-party investigator, her disbelief mounting as she neared its conclusion. The review found Marianapolis had done “an exceptional job at preventing and responding to bullying,” and took the proper steps and alerted the proper people after Tronerud’s son, Connor, reported being bullied in November 2016. But missing from the review, Tronerud said in an interview, was “a very, very important, probably the most important, piece of information:” A record of a crisis intervention involving her son, administered in 2017 at a Marianapolis-run summer camp. The paper written by a second-grader was literally a cry for help. Last year Charlotte-Mecklenburg Schools screened more than 2,100 students for suicide risk, a number Superintendent Clayton Wilcox said recently “should be shocking for all of us.” That’s triple the number logged just five years earlier – and this school year the district is on track to hit 3,000. Just as shocking: The second-grader who wrote about wanting to die was not a fluke. Hundreds of young children show risk signs each year, with the bulk falling between grades 3 and 8. Barb O’Keefe believes there’s no age too young to start talking about suicide prevention. O’Keefe works on behalf of Yellow Ribbon Suicide Prevention Program and travels to area organizations lecturing on how to best talk about and prevent suicide. She speaks to people of all ages and professions, but last Tuesday night at the Fort Calhoun Presbyterian Church she focused on addressing the sensitive topic to children. “It’s a huge problem,” says Dr. Rachel Zuckerbrot, a board-certified child and adolescent psychiatrist and associate professor at Columbia University. “What we’re endorsing is that everyone, 12 and up, be screened … at least once a year,” Zuckerbrot says. The screening, she says, could be done during a well-visit, a sports’ physical or during another office visit. Japan’s suicide rate is among the highest in the developed world. He was the “golden child,” an athlete, the Saddle Brook High School honors student who seemed to be everybody’s good friend. After her 16-year-old daughter, Cassidy, committed suicide in December 2015, Kim Hess teamed up with her daughter’s friends to find a way to ensure no other family in The Woodlands area fell victim to suicide. Hess founded Cassidy Joined for Hope Inc. in May 2016 with the hope of giving children the tools and training they need to be advocates for suicide prevention. The organization was first established as a student-led club called CAVS Joined for Hope—named for the school mascot—at College Park High School where Cassidy attended. Suicide is the 10th leading cause of death in the U.S., with a steady increase in the last 12 years. “If cancer went up for 12 straight years, you’d hear about it,” Michael Nadorff said, psychology professor and director of Mississippi State University’s Sleep, Suicide and Aging Laboratory. According to the National College Health Assessment, 2.4 percent of the student body at MSU attempts suicide every year. “I think (silence) is fueling (suicide) in that people don’t understand how prevalent it is, and how big of a deal it is because it’s hidden,” Nadorff said. Nardorff explained silence about suicide is dangerous to society because it increases the stigma. With suicide rates rising and an alarming number of teens and young adults at serious risk for suicide, many health professionals are not fully prepared to recognize a patient’s psychiatric difficulties. A team of researchers at the National Institute of Mental Health (NIMH) recently came up with the ASQ Toolkit, a simple four-question survey for health professionals to help identify and get help for at-risk youth. NIMH’s Division of Intramural Research Programs created the free Ask Suicide-Screening Questions (ASQ) Toolkit that can be used in various medical settings. According to the NIMH, the toolkit (available in many languages) is easy to use, making it effective in many settings including emergency departments (ED), outpatient clinics, primary care offices, and inpatient medical/surgical units. A new study shows that pets can provide valuable support and benefits to their humans, especially for those living with mental health problems. Results show that perhaps it’s time to consider pets as a major source of support in the long-term management of mental health issues. There are pros and cons to pet ownership but for many pet owners, the pros largely outweigh the cons. Researchers from the Universities of Manchester, Liverpool, and Southampton reviewed just exactly what kind of benefits companion animals can give, especially among pet owners who are dealing with long-term mental health problems. Suicides rose nearly 10% higher than expected in the months following Robin Williams’ death in August 2014, according to a new Columbia University study. Such tragedies involving the method Williams used — suffocation — spiked 32% over that time, suggesting news coverage of the beloved actor’s death may have played a role. The study, published Wednesday in the journal PLOS One, seems the first to examine how high-profile suicides affect Americans in the era of 24-hour news. Georgia officials are turning to social media to try to combat teen suicide. From 2015 to 2017, 144 kids and teens in Georgia committed suicide. This year, four children in the state have already committed suicide. The GBI is looking into a possible fifth case. Now, it’s released videos on YouTube to try to reach young people with the message, help is out there. It’s a topic many of us find tough to talk about: Suicide. But a Minnesota mom is sharing her story in the hopes of helping others. Tira Aubrecht’s 15-year-old daughter, Mariah, died by suicide. She was a sophomore at Princeton High School. And as WCCO’s Angela Davis shares, her life story is one Mariah’s mother hopes other parents can learn from. “She is my mini-me and everybody who sees us is like ‘Oh my gosh, you guys look alike.’ Well she is my daughter,” Tira Aubrecht said. Tira Aubrecht remembers a happy child with close friends, a girl who embraced being the oldest of five children. A teenager who dreamed of joining the Air Force so she could travel the world. Two moms. One terrible tie that binds. Unthinkable grief for both. They are good people. Parents, with real, personal stories of years of crippling heartache because their kids aren’t coming back. Their stories stayed with me, long after the interviews were over. Because in their loss is such an important lesson for all parents, now more than ever. Kids are dying to an epidemic that doesn’t discriminate.From the suburb of Rocky River, to a Cleveland neighborhood on Kinsman. Rocky River High School Senior Micah Lewins’ 18th birthday was just 5 days before his death. “He was a football player. He was a wrestler. He was a good, well rounded kid,” Micah’s mom Jane Lewins tells us. We’re sitting in Jane’s Westlake office where throw pillows and everything positive feels like the comfiest of homes. It’s where Jane counsels kids contemplating suicide or families surviving in spite of it. She is unwillingly overqualified for the position. The song is named after the National Suicide Prevention Lifeline’s hotline number and it’s a powerful anti-suicide anthem whose lyrics demonstrate a cry for help from someone who’s suffering — and the caring response this person will receive. 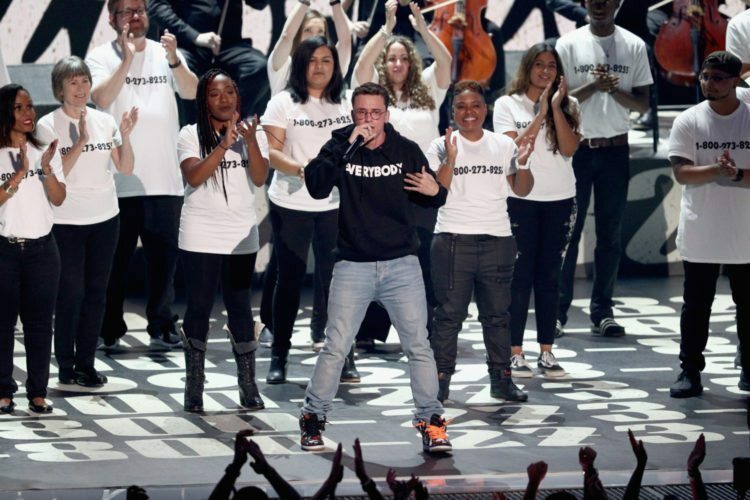 Logic raised awareness on the Grammys stage during his empowering performance of “1-800-273-8255” on Sunday night. During the performance, the rapper, alongside Alessia Cara and Khalid, was joined by a group of suicide survivors donning T-shirts that displayed the hotline number and inspirational message that read, “You are not alone.” The song title is the number for the National Suicide Prevention Hotline. The circumstances surrounding 8-year-old Gabe Taye’s suicide still haunt Angela Jones. “It was kind of sad, like, it was real sad,” Jones said. Jones is the parent of two students at Carson School in West Price Hill. It’s the same school Gabe attended, and it’s been loudly criticized by parents who support Gabe’s mom, Cornelia Reynolds. WLWT investigator Todd Dykes spoke to Reynolds four days after her son took his life. About four months after Dykes spoke to Reynolds, video surfaced that captured an incident in a bathroom at Carson School. The video shows Gabe falling to the floor — pushed down by another student, according to attorneys for his family. Gabe lay motionless for five minutes before help finally arrived. While expressing sadness about Gabe’s death and vowing to more aggressively deal with bullying issues, Cincinnati school leaders say the 8-year-old fainted in the bathroom. A Black student in a DC boarding school was discovered dead by her roommates of an apparent suicide. She was only 12. According to Fox 5 of DC, police were called to the SEED School of Washington D.C. on Tuesday after the girl’s roommates found her unconscious at around 6:15 a.m. Paramedics could not revive her. The school called parents to tell them to come pick up their children that morning. It is not yet clear what the circumstances were around the suicide. Mami Buxton pulled her son out of SEED after he endured two years of bullying and was even allegedly sexually assaulted by another student. She said that she was upset to see someone else’s child suffering too. “It kind of touched me really deep because of the situation that has been happening with my son at this school,” Buxton said. Investigators were made aware of the potential cyberbullying against the girl while looking into the death, which led them to examine several cellphones and social media accounts, the news releases. Reviewed 17 studies (published 1969–1988) covering 3 major areas pertinent to attempted suicide in adolescence: characteristics of the attempt (lethality, intent, and precipitants); psychological factors associated with suicidal behavior; and follow-up course. Findings suggest that there was a significant degree of individual and family dysfunction among many adolescent suicide attempters. In a school with outstanding academic performance, other issues can linger beneath the surface. This is especially true for the Mason school district. Over the past decade, Mason High School has seen thousands of students pass through its halls and enter the real world. In that same time frame, Mason has lost nine students to suicide. This represents an average of one suicide every year. Mental illness is an epidemic among teenagers today, affecting an estimated 20 percent of all 13- to 20-year-olds. A study published in Pediatrics at the end of 2016 found a significant rise in teen depression over the last few years, but little to no increase in mental health treatment. This rings true at Mason. Adolescents who experienced severe bullying by their peers earlier in childhood may be more likely to suffer from depression, anxiety and suicidal thoughts than teens who weren’t routinely victimized by other kids, a Canadian study suggests. Parents in a northeast Ohio town are being asked to watch their children closely after six students in the same district took their lives. The Perry Local Schools District in Canton along with law enforcement and mental health experts expressed their concern on Friday. Four high school students, one middle school student and a recent graduate all ended their lives within this school year. Health experts are calling this a “suicide contagion.” It means exposure to suicide can increase suicidal behavior in others. A local mom, struggling to deal with her son’s death, wrote a book about her search for answers. She hopes her pledge to write her son’s name – on every beach – will help others. A sand-sketched tribute that salt water will soon wash away. But for Susan Auerbach the exercise brings a lasting calm as she reflects on her son Noah. “Just trying to connect with his memory,” she said. In life, Noah Langholz loved the beach and surfing. He loved his family. So when the outwardly confident college junior took his life by hanging, in his parents’ garage two days after running the Los Angeles Marathon in 2013, the unthinkable traumatic loss hit his mother like a tidal wave. Community leaders are asking parents to talk to their children about suicide following the deaths of five current and one former students in a small Stark County district this school year. …The string of deaths, however, is being looked at as a “suicide contagion,” which is when exposure to suicide increases suicidal behavior. Carole Vesely, with the Crisis Intervention and Recovery Center, said being a teenager or going to the same school could be enough of a connection. Australians loved her pretty little face. They knew her name. 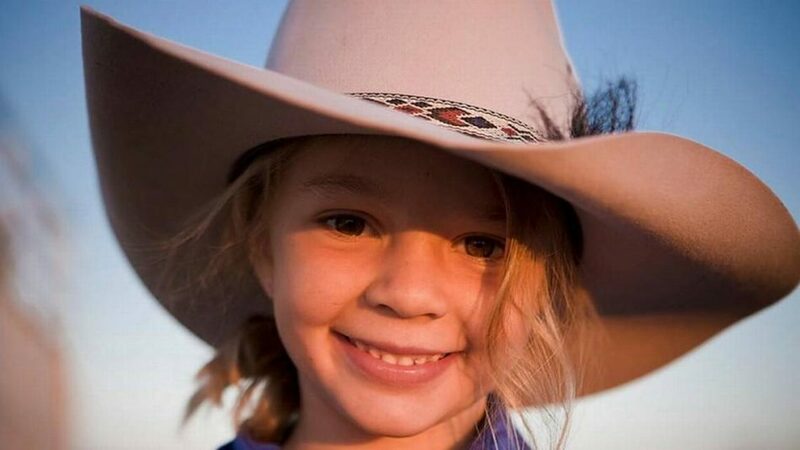 She was the Akubra Hats girl, the face of the iconic outback hat company’s advertising campaign when she was younger. She became the symbol of Australia’s Outback. Amy Jayne Everett, known as Dolly, killed herself on Jan. 3 “to escape the evil in this world,” her father says. By evil he means bullies. A week ago, Logan Paul uploaded a video to his 15 million subscribers titled “We found a dead body in the Japanese Suicide Forest . . .” The video’s thumbnail image — the still image that shows up on YouTube’s trending pages and search results as a preview for the video — showed a partially blurred body hanging from a tree in the background; in the foreground was the YouTube superstar’s worried face. Paul was wearing a funny green hat. Two major Apple shareholders have taken the unusual step of warning the Cupertino company about the potential dangers of their most popular product. In an open letter to Apple, published on Saturday, Barry Rosenstein and Anne Sheehan cited studies linking the use of iPhones and other devices to increased suicide rates among teens. Writing on behalf of hedge fund Jana Partners and the California State Teachers’ Retirement System (CalSTRS)—who collectively own around $2 billion in Apple shares—the pair highlighted the need for more research into the impact of smartphone use among young people. “More than 10 years after the iPhone’s release, it is a cliche to point out the ubiquity of Apple’s devices among children and teenagers, as well as the attendant growth in social media by this group,” the letter stated. “What is less well known is that there is a growing body of evidence that, for at least some of the most frequent users, this may be having unintentional negative consequences,” it continued. The major goal of this project is to “define ‘suicide-related behavior’ on social media and use that classifier to conduct market research on the general population. … I thought about this story after a conversation I had with my oldest daughter, regarding the increase of suicide among young girls. She was troubled by the number of teenagers and young adults she encounters, who bear scars in their arms and wrists, evidence of their profound despair and hopelessness. The conversation prompted me to do some research on the stats of suicide in America. According to a report released by the Centers of Disease Control and Prevention (CDC) in 2015, suicide is the 10th leading cause of death in the U.S., claiming the lives of almost 45,000 Americans every year. Furthermore, after a steady decline in the ’80s and ’90s, statistics now show that the suicide rate has increased steadily in the past several years, with one group standing out — girls between the ages of 10 and 14. Although they make a small portion of the total of suicides, the rate for this group has increased more than any other, tripling over 15 years from 0.5 to 1.7 per 100,000 people. AOKIGAHARA FOREST, Japan — Long before the YouTube star Logan Paul brought renewed notoriety to this primeval forest at the foot of Mount Fuji by posting a video of a body hanging from a tree, local officials fought to reverse Aokigahara’s bleak reputation as one of Japan’s top suicide destinations. The forest looms large in the national consciousness, emblematic of a persistent suicide problem in Japan, which has one of the highest suicide rates of developed countries despite improvements in recent years. At Aokigahara, signs at the foot of walking paths promote a suicide hotline. “Life is a precious thing that your parents gave to you,” the signs read. Another offers a number for help with debt. Locals patrol the forest, talking to people who are alone or show signs of depression or suicidal plans. State authorities are investigating the suicide of a 12-year-old Lexington County boy who, his mother said, killed himself after being bullied at school. Lexington County Coroner Margaret Fisher ruled the boy’s Dec. 29 death a suicide. She said he left a note that helped investigators make that determination but declined to comment on further details about his death, including the potential role of bullying. A parent’s love is highly durable, and when a child suffers a mental illness that love bears a special responsibility that will last a lifetime. Stefanie Hoffman has this Perspective. It’s funny how we only hear about suicide when it’s too late – after it’s been committed. For many, suicide is always accompanied by shock as well as sorrow. “Why would they do that?” I often hear. But I have a bit more insight. For the past eight years, my daughter – who goes to school in another state – has struggled with a volatile depression associated with bipolar disorder that has led to several suicide attempts. And I’ve had a front row seat. On Instagram and Snapchat, sadness melded with rumor and fear. Students reeled first from the suicide of a 16-year-old girl at Walt Whitman High School in Bethesda, Maryland. Six days later, social media lit up again. Another student was dead in the same suburb outside Washington. For a second time, teenagers shared the loss by posting an emoji heart set against a stark black background on Snapchat. The first suicide drew a red heart. The second was green. Then, amid a wave of disbelief, some teens posted a heart in blue, suggesting a third death.